Director Justin Lin has taken to Twitter to reveal that the next installment of the Star Trek series will be titled "Star Trek Beyond." "Let the next Starfleet voyage begin! #StarTrekBeyond #LLAP," Lin wrote. The post also includes a photo of a retro-looking Starfleet arm patch, which we assume is from the set as filming of Star Trek Beyond began in Vancouver last week. Lin took over the director's helm for the franchise from JJ Abrams, who had directed the first two films of the most recent reboot. Star Trek Beyond is set to release next year, on July 8. That's right in time for the franchise's 50th anniversary on September 8, 2016. 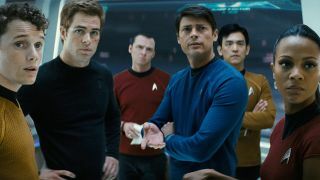 Star Trek Beyond will see Chris Pine, Zachary Quinto, Zoe Saldana and Simon Pegg reprise their roles as the commanding officers of the U.S.S. Enterprise. It's also rumored that Idris Elba will join the cast in an unknown role. Talking to Deadline Hollywood, Lin said that this film will not rehash much from the original TV series, hence the title. "It's all new and fresh," Lin said. "The Klingons, Romulans, and other species are great, but it's time to go further. It has been fun to focus on creating whole new worlds and species." We'll see how the crowds react to Lin and crew's creations next summer.